What are you doing there, poor thing? What kind of truth do you embody if you look more like a failure of an emulation project? Those are possible questions to ask when meeting the precariously stuffed 195-year-old Ocelot displayed in the Museum of Natural History in Berlin. 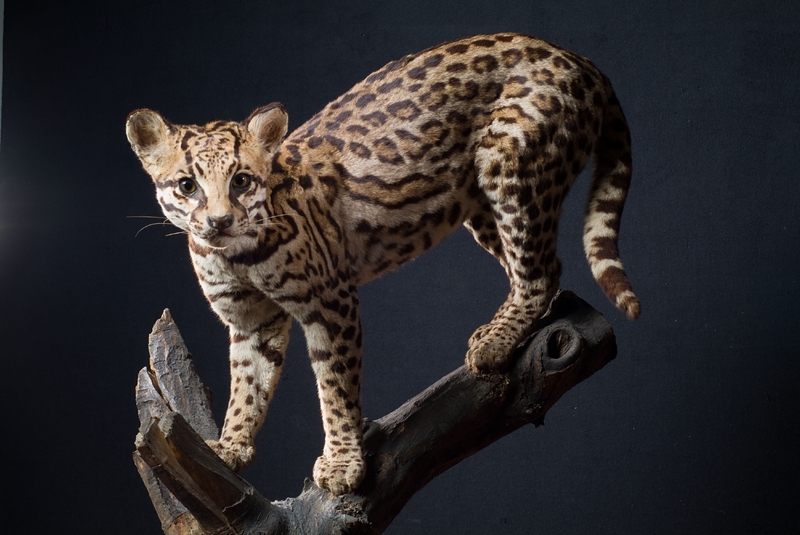 The old Ocelot barely stands on its feet, its faded coat offering just a loose-fitting connection to what it once was, when alive in the Brazilian wild. Certainly, when young Friedrich Sellow embarked on the exploration journey of the South American continent neither the ocelot nor the collector from Potsdam could predict their encounter. 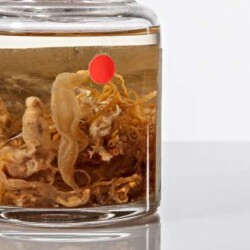 As his mission was to gather various kinds of objects, I wonder if that ocelot was to Sellow nothing but another of many specimens to be sent to scientific institutions in Berlin. Was it Sellow himself that killed the ocelot? Maybe one of the diaries or excursion reports he left can tell me something about the weak wild cat I faced. What a weird kind of magnetism you have. What you offer has nothing to do with getting as close as possible to an “immobile liveliness”. The lack of filling makes you fragile enough to not even give me the impression you can move. You make people laugh, as I have witnessed while looking at some reactions towards your deformed face. However, the tip of your ears made me wonder if they were eaten-away by another animal in a fight. Different from the rest, they look very convincing. The worn-out Leopard pardalis is not alone inside the glass box. 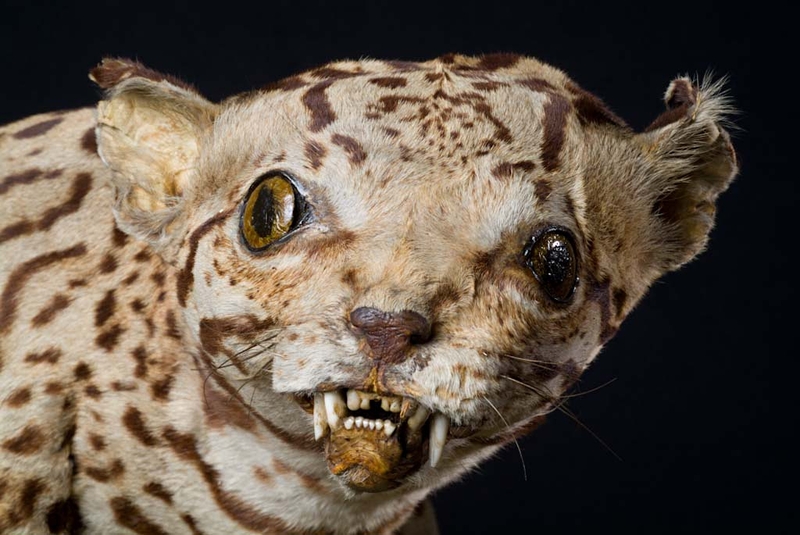 He is placed right under another example of the same species, this other object of an anatomically accurate taxidermy carried out 115 years after Sellow’s Ocelot. They look so different from one another that I spent half an hour absorbed only in the imperfections of the old wild without noticing its good-looking fellow. I realized only much later that the old Ocelot was there to be compared with a better animal, frozen in a “moment of supreme life”, young and daring, this one even seeming to respond to my gaze. But the opaque and frosted eyes of the distorted Ocelot do not give me any illusion of a majestic encounter. I wonder what a frustration in the quest for perfection that might have been. Recommended texts: Teddy Bear Patriarchy: Taxidermy in the Garden of Eden (1984-85), by Donna Haraway, in which the author critically argues that the realism of taxidermy is not understood as a point of view, but it rather declares itself as a “peephole in the jungle”; and The Breathless Zoo: Taxidermy and the Cultures of Longing (2012), by Rachel Poliquin. 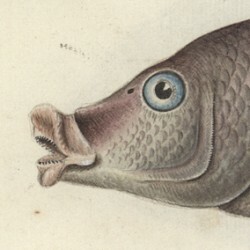 This text is one of a number of texts written for the Wissensdinge project by students of the University of Potsdam as part of the course Critical Animal Studies in winter 2013. The class was taught by Anja Schwarz for students of English and American Studies. 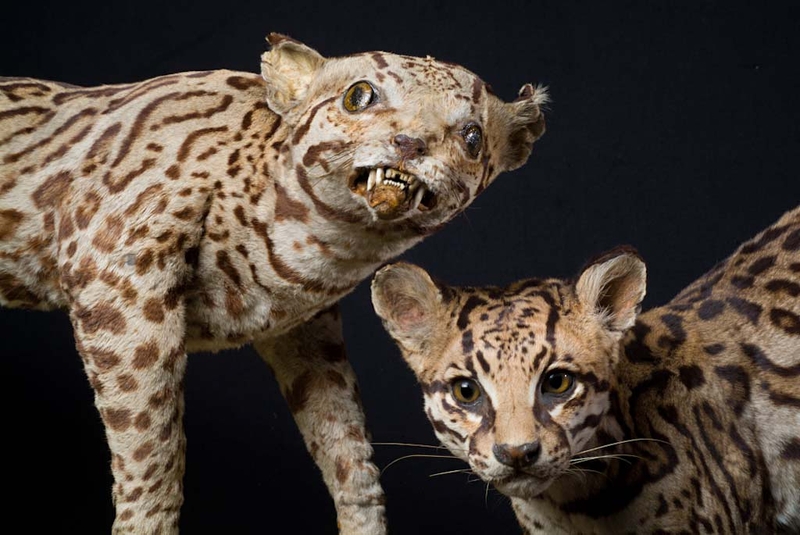 While the taxidermy on the left seems a bit scary, the other one gives visitors a vivid impression of what a live ocelot looks like. 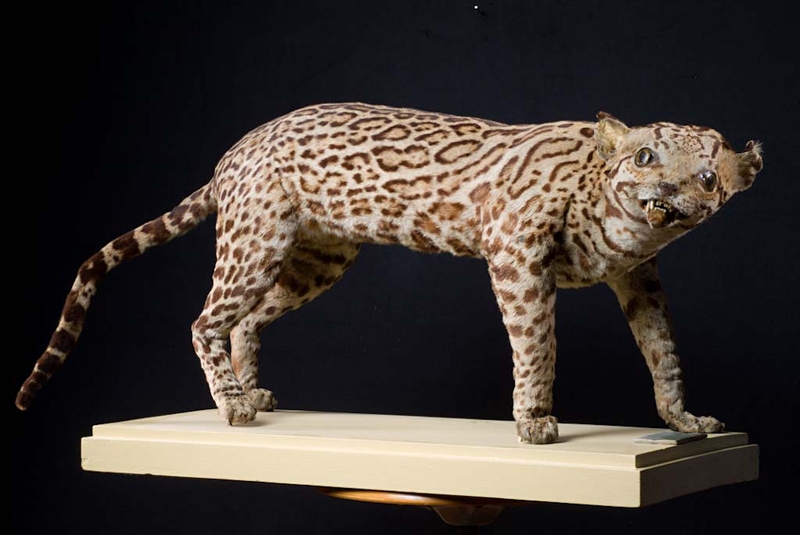 Taxidermy of a Brazilian ocelot, 1819. The taxidermist Alfred Kästner prepared this taxydermy in 1934. 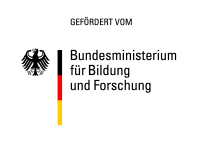 Katia Fonsaca is a postgraduate student of cultural and postcolonial studies at Uni Potsdam. As well as the old Ocelot, Katia also comes from Brazil.